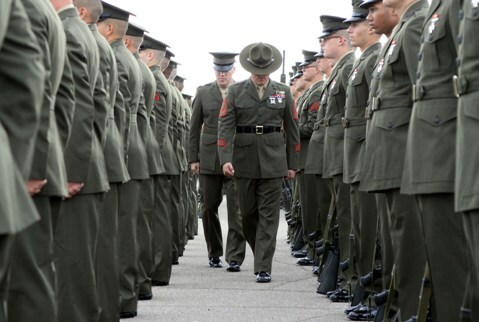 See that drill instructor in the photograph? That’s the sight of a squared-away Marine, inspecting recruits in March just before their boot camp graduation. It’s an image that screams discipline, toughness, fortitude. It’s no surprise, then, that NBC’s “The Biggest Loser” has called on the Marine Corps to provide some motivation in tonight’s episode. The show will air at 8 p.m.
Based on a preview posted on Monsters and Critics, it isn’t all that clear which part of the Corps has been called on for the job. In any event, prepare for lots of screaming, crying and, hopefully, a happy ending.